In the last two years of going to the Consumer Electronics Show, we have seen our share of charging mats – most notably, Powermat. The idea is simple: place your device on the pad and let it charge. Energizer – in cooperation with the Wireless Power Consordium (WPC) – have developed the Energizer Qi. It is a 2 bay mat to place your devices and let them charge. For it’s release in October, it’s only the iPhone and Blackberry 8900 (with other devices coming soon). You slip on the case and set down the device. Once done charging, you take off the mat. On the mat you will see the Qi symbol. Place the device on the symbol and the device will charge using conduction. The one thing I notice is the case covers the dock. I don’t see a way to charge or sync data unless you pull the case off it. The price tag is $89 for the mat, then about $35 per case. It’s a better price than PowerMat, but it’s still pretty expensive for simple charging. In charging batteries, you learn that the best thing to do is let the battery drain to almost nothing, then recharge. However, in today’s disposable market, we just continue to charge until the battery doesn’t work, then go get another device. Technically, it’s still a cord plugged into the wall. It’s just that you don’t have to plug the phone in – you just have to plug the phone to the case, then set it on the mat plugged into the wall. 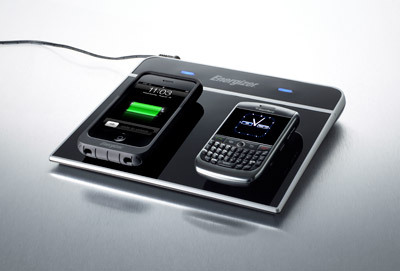 Since you may not have both the iPhone and Blackberry 8900, there is nothing else that can be charged – for now. Even with the PureEnergy Mats we saw at CES, they had docks so you could plug in an adapter to use the charger. The Energizer Qi is a good start, but limited for the $124 price tag to charge a phone. Winners announced in the Summer of Podcasts Contest II Are You Ready for iSEO, SiSEO (Subliminal Instant Search Engine Optimization)?